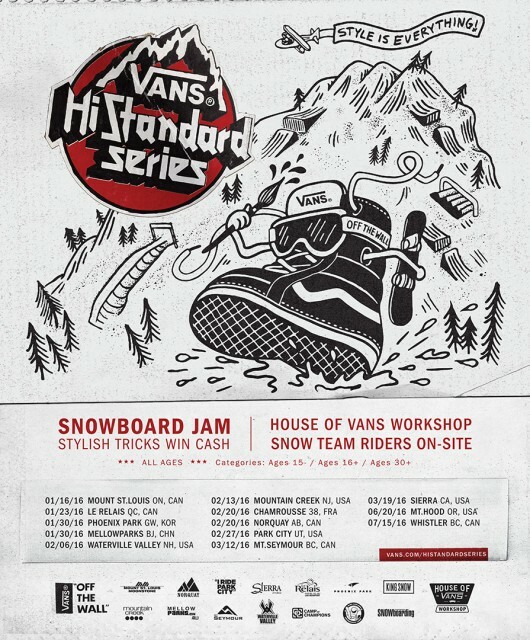 Recently, Vans announced that they're bringing back the Hi-Standard series. In said contest series there will be "no rotations over 720 allowed." Check out the schedule and come find me at the June 6 stop on Mt. Hood. I remember when Air and Style enforced a 540 rotation cap in the past and I remember some spine-warping shifty spins coming out of that comp. I wonder what it will be like this time. Will the big multi corking names be invited only to see the rest of their trick bag? Or will it be a bunch of local kids with style for miles getting one-footed or/and handplanted? Details are mixed on the setup. One part mentions big air another hypes up the "Van Doren Rail Best Trick". One would hope the setup is as creative as they're hoping the riders get. Who would you pick in a contest where there's a 720 rotation limit? Jed Anderson is up there for me. He can do everything. Jumps, rails, handplants/drags. He won the Burton Canadian Open Halfpipe in 08/09 with about the most stylish Tricks on tricks, ya herrrd? Who you got? Here's another thought, when the hell did it come to this? I know, the 'style vs. spins' fight has been going on forever. But when did the first contest organizer say, "Ya know what, no spins over 720"? Maybe just make the judging reflect what you want to see. If this 'sport' had promoted style from the beginning, it wouldn't have been a problem. If you scored an X-Games pipe run that featured six double corks the same as one where the rider fell on his first hit, and the best McTwist won, riders would get the point real quick. You might even see a different crop of riders and you'd definitely have a different fanbase. Maybe I'll start a mini-air series to go along with Bode's mini-pipe comp. Another thing it reminds me of, a video game I had. I don't remember what it was called, but I remember different levels having bonuses for different tricks. One level would say, "This level you get bonuses for nosepresses." It's the kind of game where you need a certain amount of points to clear a level. Guess what? You still got more points for the giant flipping spinning video game tricks than you did for any nosepress you could ever do. I don't know what that rant had to do with anything, other than arbitrary judging. Hopefully it doesn't turn into who can do the best 720. Where's the line? Who knows!? Can you get a big contest together an just have dudes chuck methods? They did that at the X-Games, too. Once. Then they busted out the triple corks right after. So long as it's a contest, people will get good at whatever wins. You want to see a fun contest. Go to the Baker Banked Slalom. Wait for it. Not the race, though. The sub-contest doesn't get much hype, but it's the best game in town. It's a handplant contest on a mini-hip. Best plant gets a ticket to next year's LBS. Other cool tricks get swag from the sponsors. It's just a bunch of shreds hiking a nice hit and getting rad. Anybody could do it anywhere. It reminds me of when I started snowboarding. We either used a picnic table or a shiiiiity little jump. And we'd hike that all day. Mini-jib and micro-air. The Vans Comp will be nothing like that, but it could be worth watching anyway. Check it out starting January 16.